It seems like every morning, there’s some really bad news to wake up to. Most often, it’s the “oh my god, this world is going to hell in a handbasket,” fucked-up sort of news. But this morning, it’s the “oh my god, we’ve lost a really, really good one” sort of news. 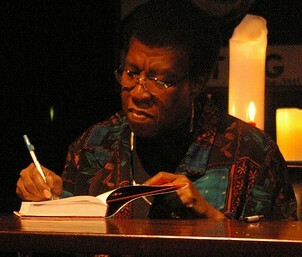 Octavia Butler, the brilliant Black sci-fi author, died this weekend at the age of 58. I’ve only read one of her books, The Parable of the Sower, but between reading that and hearing & knowing so much about her – about how inspirational and important and insightful her work is to so many people whose taste and opinion I deeply respect – I know that, yes, we have lost a really good one, a really important one. Reading the news this morning made me profoundly sad and shaken, a little nauseous, even. She was on Democracy Now! back in November. I never got a chance to listen to her interview, but I think I will today. Goodbye, Octavia Butler. And thank you.